ESIC Delhi publishes the ESIC Insurance Medical Officer Recruitment 2018 notice @www.esic.nic.in. And the link of ESIC Delhi 771 Insurance Medical Officer (IMO) Posts Application Form has activated on the same date of notification release and will continue in the active state till the closing day of 10th Nov 2018. ESIC Delhi Medical Officer Application Submission process should be done by the candidates who have the requirements stated by the officials ESIC Delhi. Everything related to the ESIC Insurance Medical Officer Recruitment like notification, the application form is obtained in this page. Certainly, after a long period of time, a new central govt job notice with a 771 number of vacancy is released. Almost maximum job seekers have knew about the ESIC organisation. Why we have mentioned that name means, the Central Govt job Notification which is going to mention here is from ESIC only. ESIC Delhi has stated the employment news of ESIC Delhi Medical Officer Recruitment 2018. Starting of the topic only we had given the qualification to save the time of the candidates. This is purely for the Medical Qualifications possessing candidates. 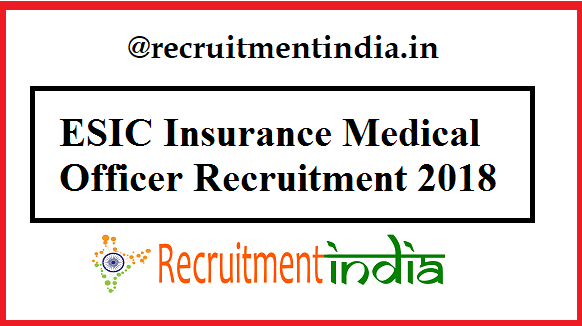 So initially we are alert the candidates if you are from the Medical Academic profile, then you can check out this ESIC Insurance Medical Officer Recruitment. Otherwise, notice the Recruitment notifications that are according to your educational qualifications. For the details registration of ESIC Insurance Medical Officer Recruitment, candidates have to open the ESIC Delhi official page i.e.www.esic.nic.in. In no other sites, the application form is not available for the candidates. Strict rules are implementing by the recruitment board in the issue of ESIC IMO Application Process. The officials will approve the applications which are reached them on or before the last date that is 10th Nov 2018. If 10th Nov 2018 day is closed, then they stop the portal which has activated for the enrolling purpose. For all contenders this rule is applicable. Eligible ones to apply the www.esic.nic.in IMO Online Form, the right time is 12th Oct 2018 to 10th Nov 2018. So finish this registration first and then collect the previous papers to know the exam pattern. A recognized medical qualification from the Indian Medical Council Act, 1956. For this ESIC IMO Vacancy, the selection process is mentioned in the ESIC Insurance Medical Officer Recruitment Notification. ESIC Insurance Medical Officer Salary is Level – 9 of Pay Matrix (Rs. 53,100/- to Rs. 1,67,800/-) as per 7th CPC. Other allowances are also there for the candidates. Thousands of candidates are eager to apply for the ESIC Insurance Medical Officer Recruitment 2018 because the one who got this job will have good life here in there is job security with good salary package with additional benefits or allowances availing for the ESIC employees. Hence due to these factors, applicants are showing that much response towards the ESIC Delhi Medical Officer Recruitment. Having interest alone cannot make you successful to get this job. Interest along with the eligibility matched criteria, the proper way of application submission, hard work of syllabus preparation and showing marks gaining performance in the exam. Those who do all the mentioned work, this ESIC Delhi IMO Recruitment is for them only. For attending the ESIC Insurance Medical Officer(IMO) Recruitment as a competitor, you have to take the help of this page. As the guidance to finish off the ESIC Insurance Medical Officer Application Form evenly is given by Recruitmentindia.in by this page. The details we have taken from the official ESIC Insurance Medical Officer Recruitment notification is explained here in simple words. In keeping the view of the candidates’ feasibility to know the ESIC Delhi 771 IMO Vacancy Notification completely, we categorisd the sections of eligibility and given below. ESIC Delhi officials will not give the admit card to the candidates who submit the forms without meeting the eligibility criteria. what is subjects for mbbs …in esic form ?